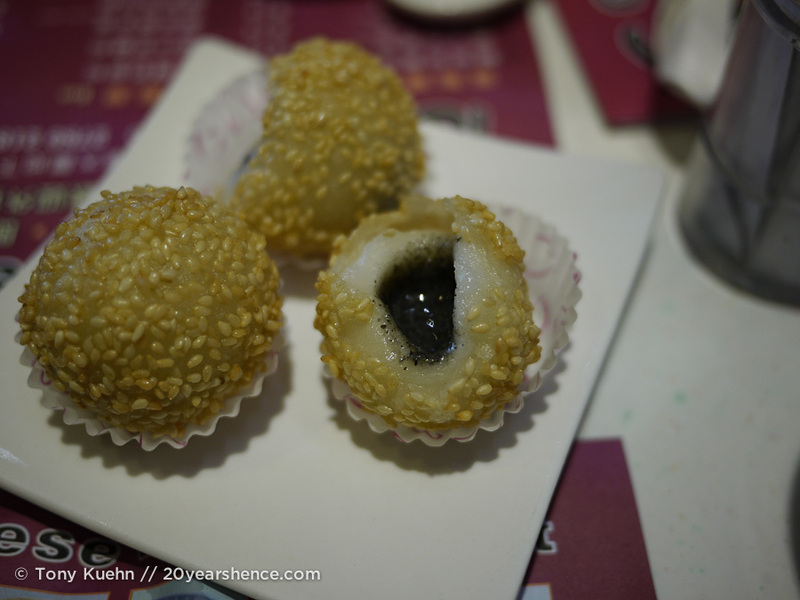 Any foodie worth his or her salt will have heard about Tim Ho Wan. Considered by many to be the holy grail of dim sum (think Chinese-style tapas: you order small portions of many delicious dishes and wash them down with copious amounts of tea), THW is frequently spoken of in hushed, reverential tones by those who have dined there. 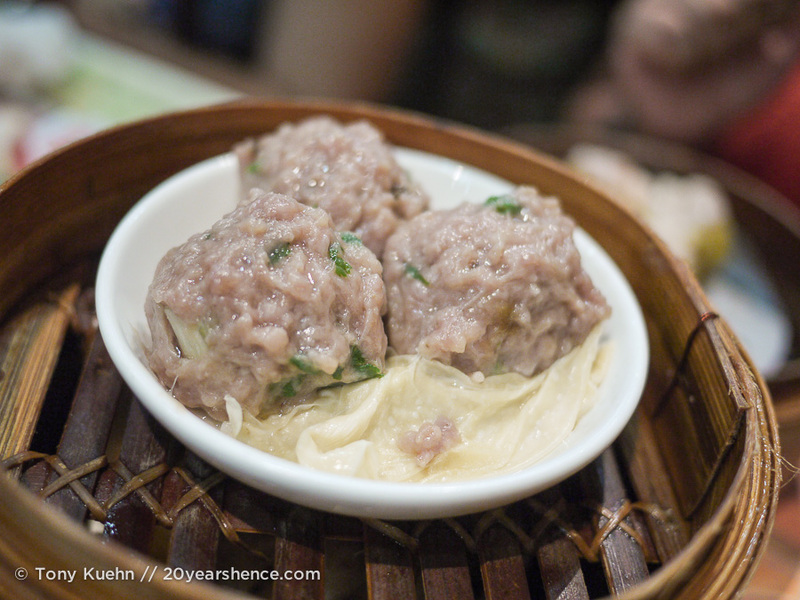 Dim sum is generally beloved by those who are food-focused, but the dishes at THW in particular are known for being absolutely stellar… and that’s not hyperbole: despite its humble repertoire of dishes, THW has a coveted Michelin Star to its name! As if that shining stamp weren’t enough of a beacon to rack up traffic, THW is often touted as being the cheapest Michelin-rated meal you can get anywhere on the planet. With most dishes costing on average $3 USD, you can dine like a gourmand for about $12USD per person. 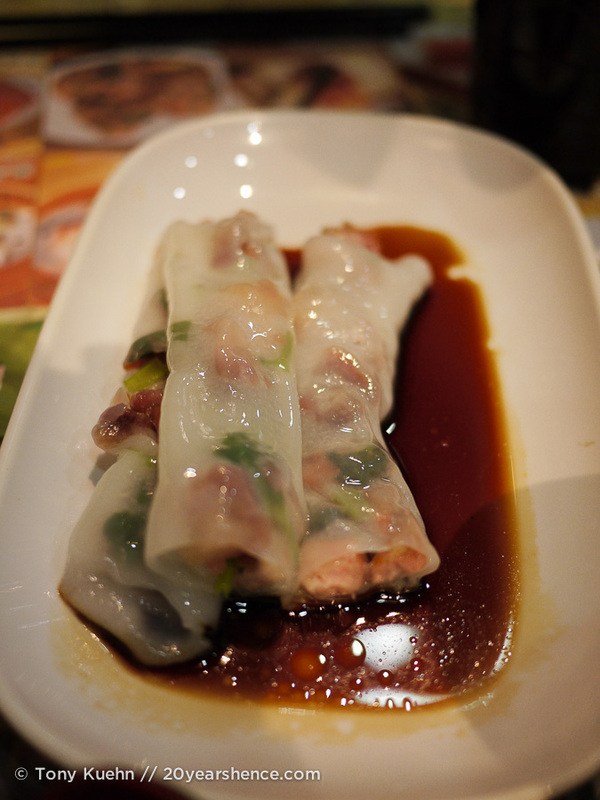 However, as we quickly learned, Hong Kong is the land of good eating and features many excellent restaurants. For a country so small, I was astounded (and excited!) 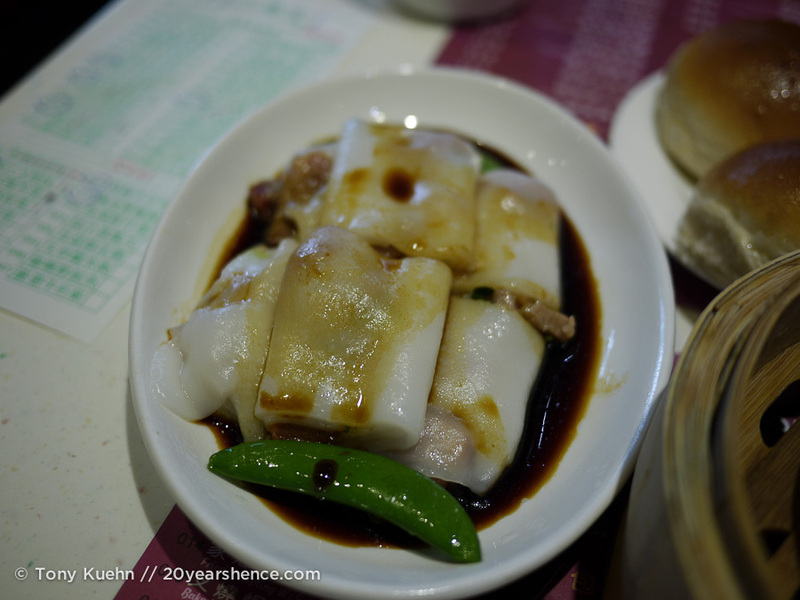 by the number of Michelin stars it has under its belt – I believe the free tourist map we picked up one day at Victoria Harbour listed approximately 20 places that have earned Michelin approval of some degree. As we hungrily glanced at the list, duly noting THW’s inclusion, our attention was captured by another restaurant: One Dim Sum. Cue the record scratch! 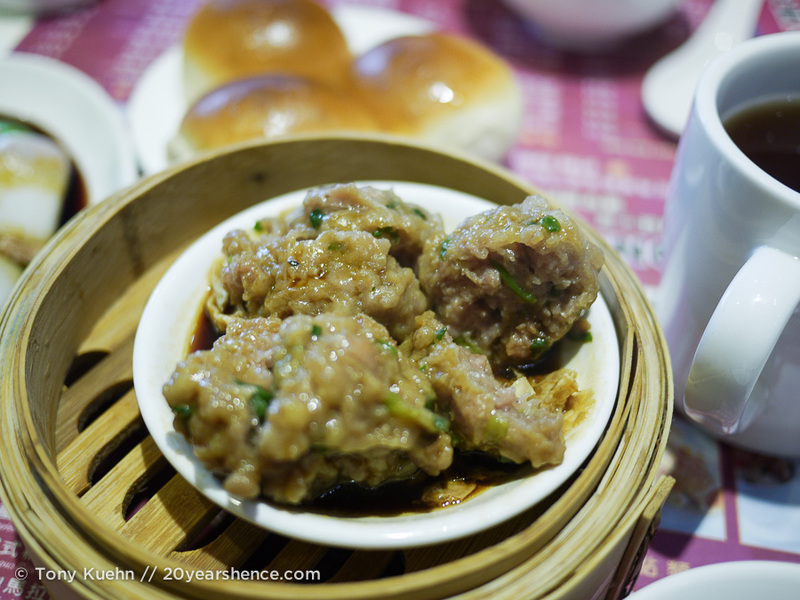 How was it possible that in all the research we had done we had failed to discover that there were not one but TWO star-spangled dim sum establishments in Hong Kong? Why was it that despite equal rating in the eyes of the venerable Michelin guide, only THW stood in the culinary spotlight shone by bloggers and international media alike? Suddenly the path we had to walk was blindingly obvious: we would eat at both restaurants and determine which of the two was most deserving of its star! 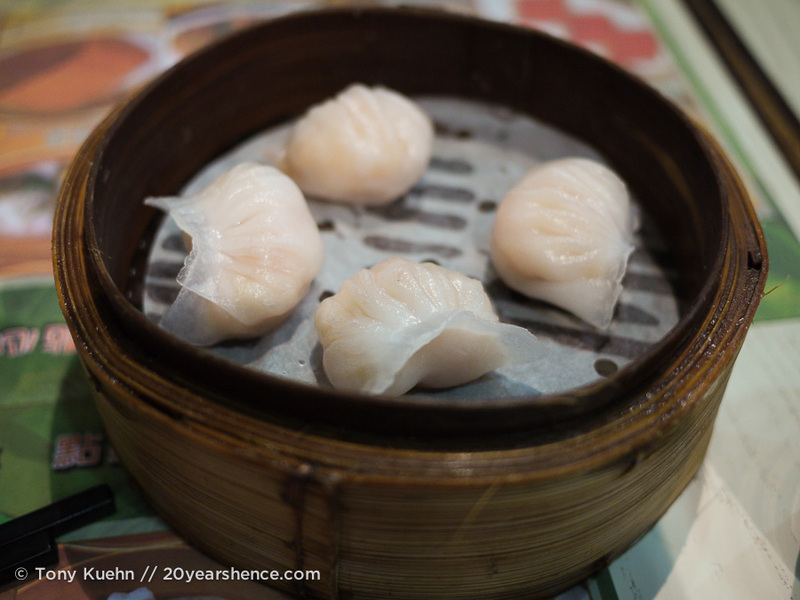 It would be a dim sum superchallenge, a throwdown, a clash of the titans… a big boss battle! First up was the better-known culinary heavyweight, THW. 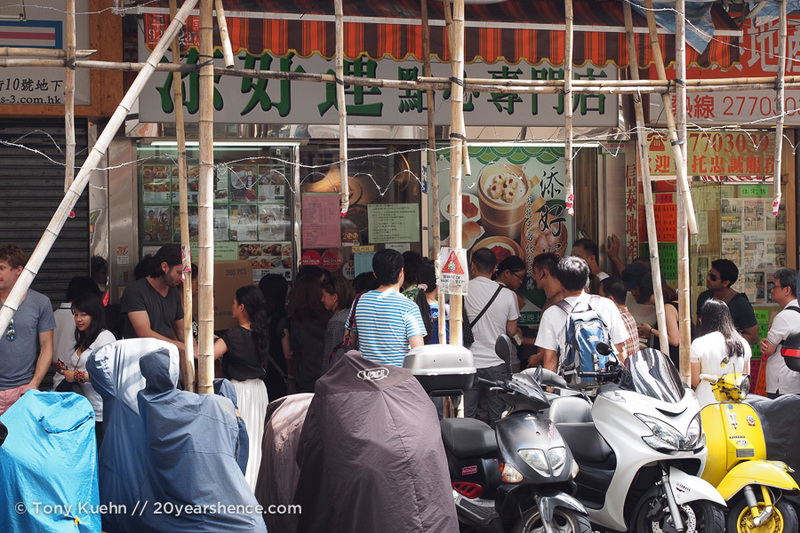 Given all the publicity it has received regarding its unparalleled dim sum delights and its ridiculously low prices, you can also bet that there’s generally a bit of a wait to get in. With less than 10 tables and no reservations accepted, waits upwards of 2 hours are not unheard of when queuing for a spot at THW. For some tourists and most casual diners, few meals are worth that kind of time investment. 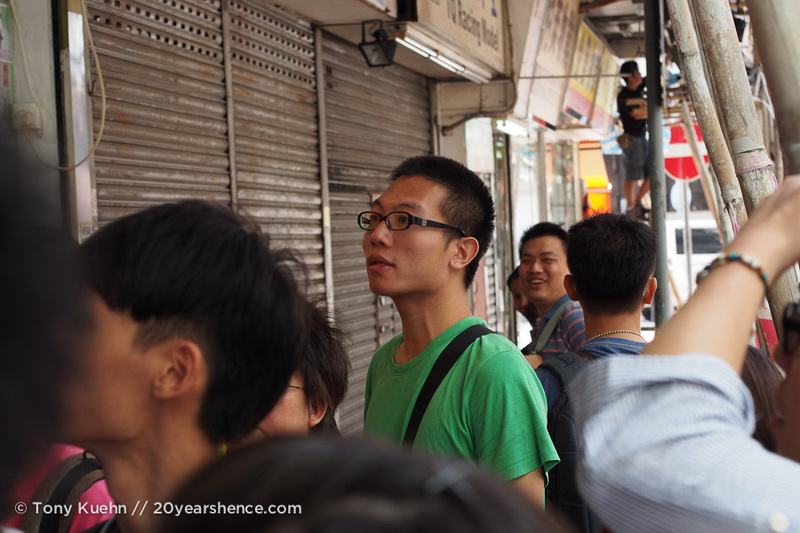 When faced with a similar length wait at the Tsukiji Fish Market in Tokyo, Tony and I abandoned ship and went somewhere else. We wound up regretting that meal, and vowed not to make the same mistake again. Although I believe that very rarely is any restaurant so good that it is worth waiting more than 30 minutes to get in, even prior to instantiating this gluttonous tournament, a meal at THW was at the top of our relatively meager list of things we wanted to do while in Hong Kong. So we put our game faces on and mentally girded our stomachs for a long wait. We cunningly believed we could improve our chances of getting into THW quickly by visiting on a weekday at an off hour. Unfortunately, many other diners had similar ideas, so although we showed up at 10:30 am on a Tuesday morning, there was already a significant crowd milling around outside the entrance. Clueless about how things worked or what the appropriate protocol was, I embraced my inner Asian, and pushed my way up to the front of the pack and stood there for a bit, trying to get a sense for whether there was some kind of system at work. I quickly deduced that I needed to grab a menu, and when a THW employee appeared at the podium, I then needed to shove it in front of them and demand a number. 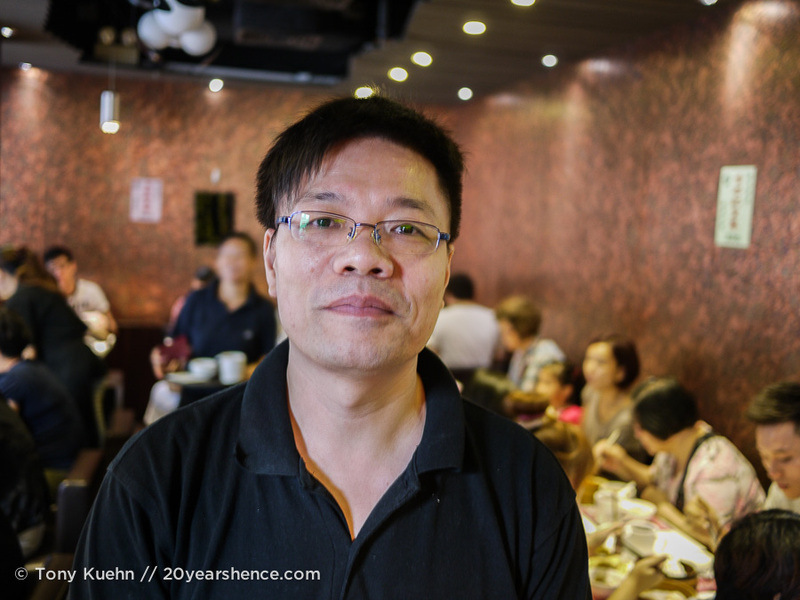 Be assertive, as being polite or meek will get you nowhere – hungry dim sum diners know no shame and will happily trample you and cut in line in their quest for a better queue position. Despite having only been open for 30 minutes, we found ourselves with (not so) lucky number 47. We had heard that THW is particularly cutthroat about kicking those who have missed their number being called to the very bottom of the waiting list, so even though there were about 30 groups ahead of us, we decided to just stick it out and hope the people inside ate fast. They didn’t. The line moved at a pretty glacial pace, as tables would turn over every half hour or so. In the end, we wound up waiting about 90 minutes for our number to be called. We waited out the last 30 minutes glued to the podium, watching as the lady in charge of calling out the numbers worked her way down the list. She was only calling the numbers out in Cantonese (we think… it didn’t sound like the limited Mandarin we know, but then again, no one in line seemed to understand her), and when she reached a number that had been given to an English speaker (as denoted by a little star on her list), she simply wrote the number on a piece of paper and waved it around, which was not really helpful at all. If we had not been standing right there, we would have missed our turn! We found out later that if you miss your number being called, you are not actually booted straight to jail, without passing Go or collecting $200. No, apparently so long as you show up before 3 pm and show them your number, they will go ahead and give you the next open table. So feel free to grab a number and then go shop or sightsee if you don’t have 1.5 hours to kill just standing around. With all this waiting, THW was going to have to serve up some mind-blowingly good food to make it all worthwhile. When our moment of glory finally came and we found ourselves sitting down at one of its cramped tables, anticipation turned briefly to dread: surely no restaurant could live up to all this hype. We didn’t have long to wait to find out, as the kitchen was working at a manic pace, churning out dish after dish almost as quickly as the servers could deliver them to the tables. I have never been more happy to report that I was so very wrong! THW not only lived up to all the hype, it completely clobbered all of our preconceived notions of just how delicious dim sum can be. Eat enough dim sum meals and you’ll have had your fair share of heavy dishes and artery-clogging grease bombs made with little skill or love (and likely the aid of a microwave oven at some of the seedier joints). 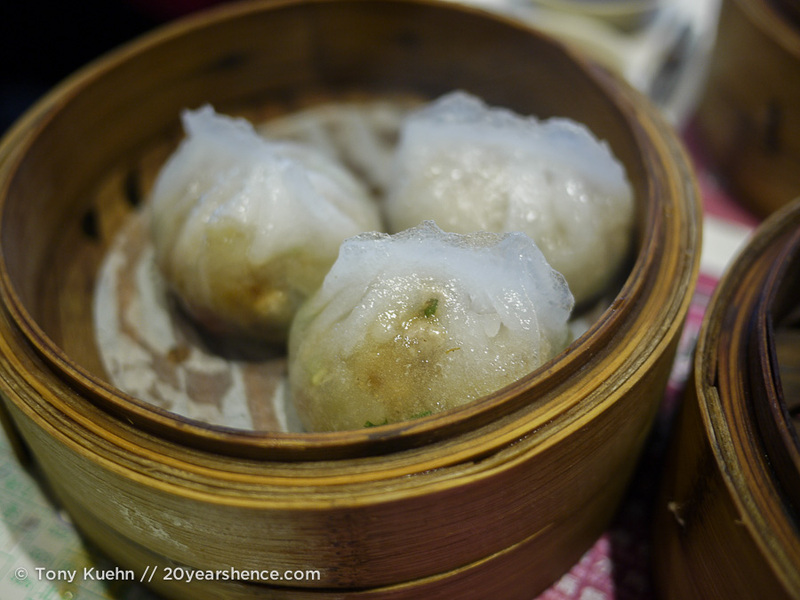 THW’s dim sum was the complete antithesis of that style of food, as dish after dish was perfectly executed and even in the cases of the richer dishes, astonishingly light on the palate. 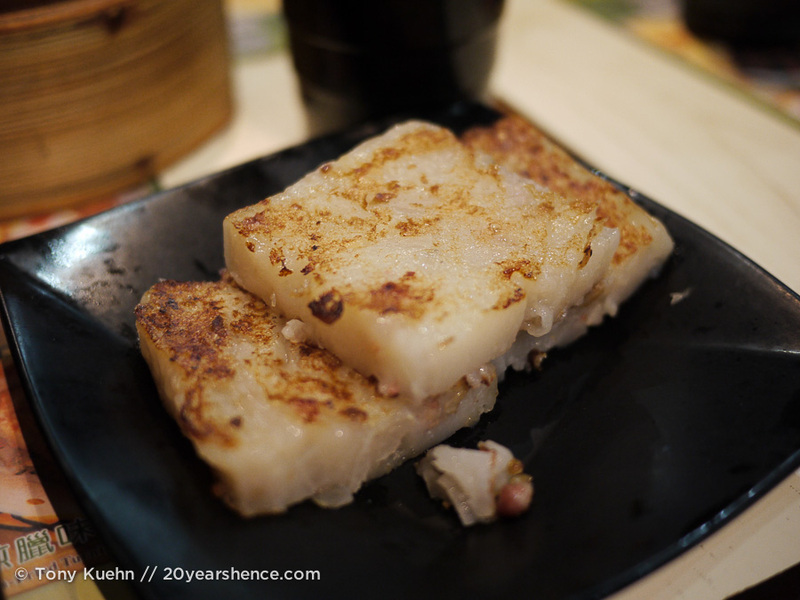 All of the dishes were impeccable, with the possible exception of the Turnip Cake, which was lacking in seasoning and didn’t have the crisp crust on it that we normally enjoy. 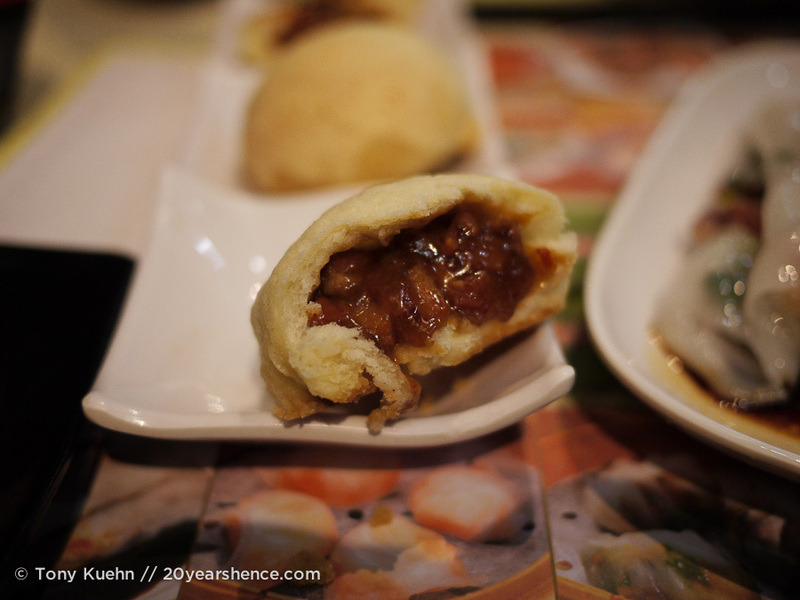 Far and away, the Charsiu Bao (Tony’s all-time favorite dish) stole the show. 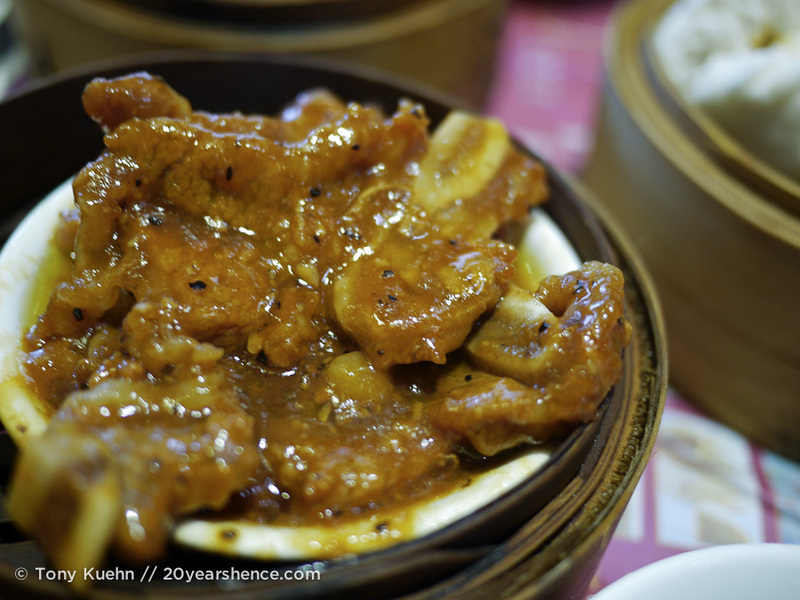 The filling was the perfect blend of sweet & savory, with unctuous chunks of pork and just the right amount of sauce with the perfect viscosity. And the bun itself, was unlike any we had ever tried before. It was impossibly light and crumbly, and thought it was more like the kind of pastry I have always associated with desserts, was honestly like biting into a heavenly cloud. 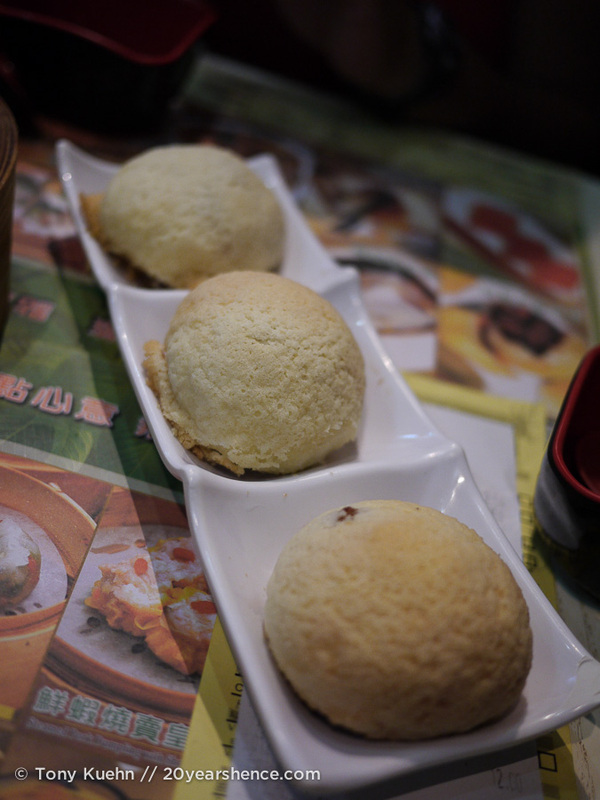 Our only regret with the dish was that we only ordered one serving of it – three of these baos were simply not enough! 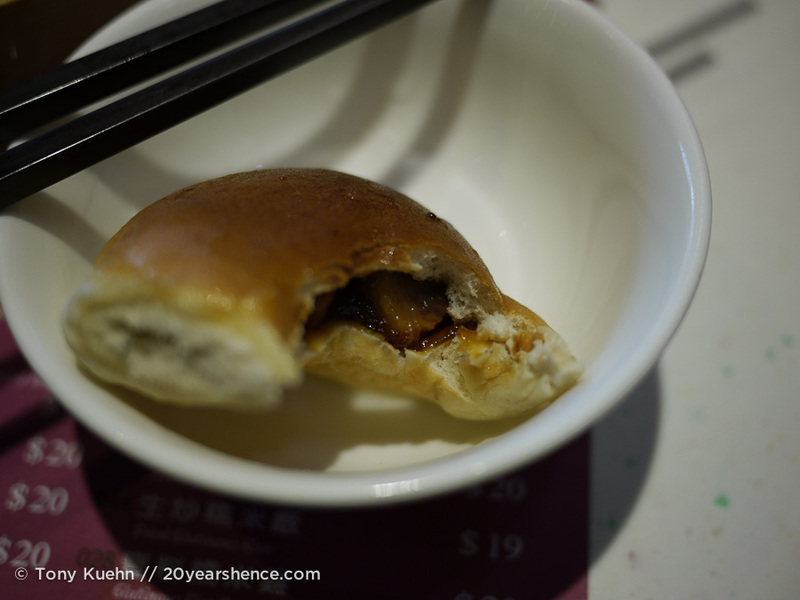 The charsiu bao are perhaps the best example of the thing that delighted me most about the food at THW. With each dish, THW took well-loved dim sum classics and brightened them up with an unexpected twist, whether it be the decadent bun on the charsiu bao, or the bursts of fresh herbs in the vermicelli rolls and bold spices in the black bean spareribs. They were clearly the dishes Tony & I knew and loved, but they had been refined and enhanced just enough to make them taste exciting and new. I often think you don’t need to mess with the classics, but at THW, any changes that have been made are surely for the better and the dishes are still fundamentally as they should be; the original soul of the dishes was clearly present, and although the flavors were complex and sophisticated, the food was not at all fussy or pretentious. Following our meal at THW, we both heartily agreed that not only had the food been well worth the wait, but having tasted it for ourselves, we would happily wait for another 90 minutes to eat the food again. It truly was some of the best food, never mind the best dim sum, we have ever had the good fortune to eat. Best of all, our decadent feast only cost us $19USD! Is it really number one? Given the food bliss inspired by THW, it was hard not to just call the battle there and then and celebrate by going for round two of those charsiu bao. But with the sanctity of the battle at stake, we decided to persevere and give One Dim Sum its chance. Unlike THW, ODS is a bit trickier to find, because you don’t have the benefit of simply looking for the large mass of people hovering about to use as your landmark. There’s no English signage outside (perhaps this was why Tony and I wound up being the only obvious tourists at ODS), however, the numbers we learned in Japan stood us in good stead as we were able to recognize the symbol for “one” and made an intuitive leap that we were probably at the right place. Although there were a few chairs set up outside, I popped inside to grab a menu only to be told by an apologetic waitress that unfortunately there would be a wait. When I asked how long, she said it would be 10 minutes. 10 minutes! That’s about as much time as it took us to fill out our order sheet at THW! We hadn’t even tried the food at ODS yet and already it was back in the game. After what seemed like the blink of an eye, we were ushered to our table inside and handed over our order sheet. As at THW, service was speedy and exceedingly efficient, but perhaps because the dining room was less crowded, we also found it far warmer and friendlier as well. Our waiter, Ken, went out of his way to explain the proper way to eat the dishes we had chosen, and in the case when one of the desserts we requested was unavailable, suggested a suitable alternative from the daily specials (which were only written in Chinese and would have been a complete mystery to us otherwise). As you might expect, the food at ODS was also excellent as is only befitting a Michelin-starred restaurant. In general, the food here seemed more traditional as compared to the dishes at THW, and we found it very hard to compare the two to one another. Certain dishes we enjoyed more at ODS such as the Black Bean Spareribs (which were actually quite unlike any iteration we had previously tried), and it’s hard to imagine how several of the dishes that we ordered here but not at THW (such as the sesame balls and the special peanut dumplings) could have been improved upon. Also, the special dessert that Ken suggested was so scrumptious that we went ahead and ordered a second serving of it! 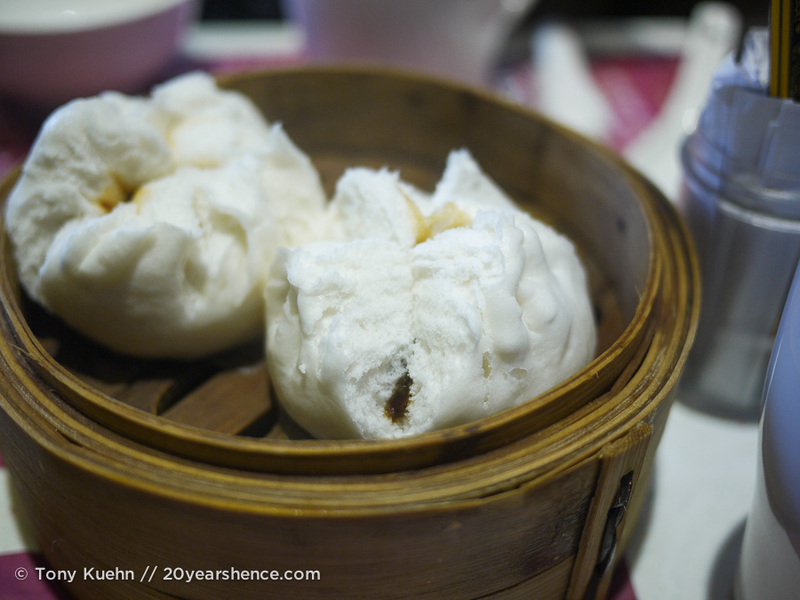 On the other hand, the memory of the THW char siu bao loomed large in our minds, and the ones at ODS, while perfectly good, were also perfectly average and just could not hold a candle to those gastronomic marvels we had sampled a few days earlier. Similarly, the vermicelli wrapped pork rolls were extremely good, but I found myself missing the fresh cilantro in the rolls at THW that cut through the richness of the dish and made it seem to dance upon my palate. Pricewise, our meal at ODS was marginally better value than at THW. Nineteen must be a lucky number in Hong Kong, because once again we paid $19USD for the two of us, though it is worth noting that for this amount we were able to sample nine dishes as compared to THW’s eight. I think it’s fair to say that in the Dim Sum Big Boss Battle, there truly are no losers. 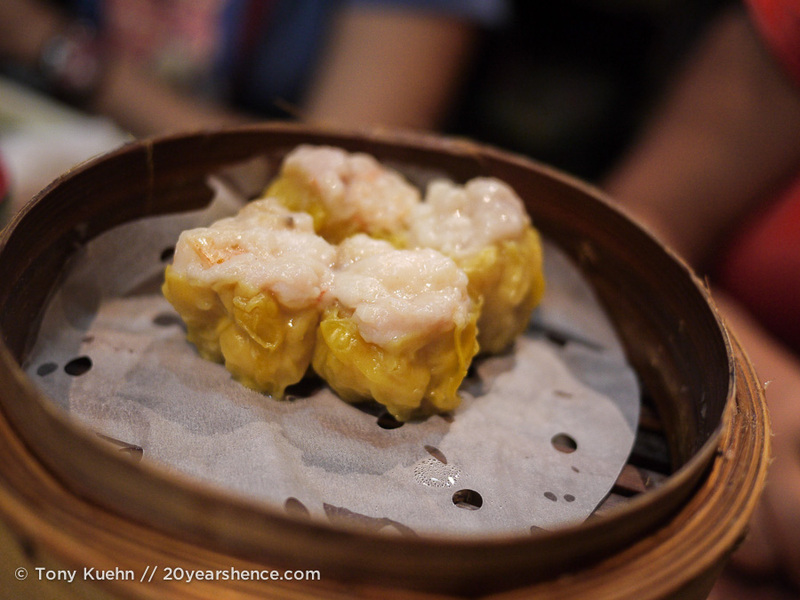 The meals we had at both restaurants were without a doubt, the best dim sum we have ever sampled. At less than $20USD, both meals were incredible bargains and we would easily consider them some of our favorite “cheap eats”. If there has to be a winner, we would probably give the slight edge to THW. 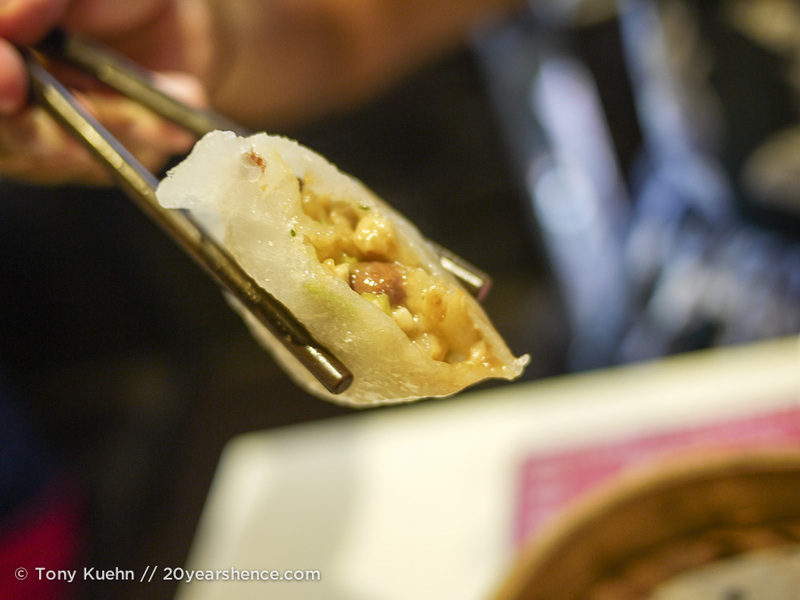 Their food consistently surprised us, and while their versions of dim sum standards clearly honored the originals, we felt they showed restrained ingenuity and innovation that is in keeping with Michelin-star restaurants. That said, we really believe that not only was the food at ODS excellent, but the service was so impeccable and deserves another mention. We were extremely well-cared for by the staff at ODS, and our waiter, Ken, was exceedingly kind and solicitous in a way that is becoming increasingly rare in waitstaff. Not only did he make a point of ensuring we were set up to maximally enjoy our meal, but when we told Ken how much we enjoyed the dessert he had recommended and said we would like another, he gave it to us on the house! He also took the time to ask us about our trip, and shared some of his own travel dreams: one day when he is older, he hopes to open up a coffee shop where he will display postcards that he has received from travelers from all over the world. Before we left, he gave us his address and asked if we could send him a card or two while on this journey. 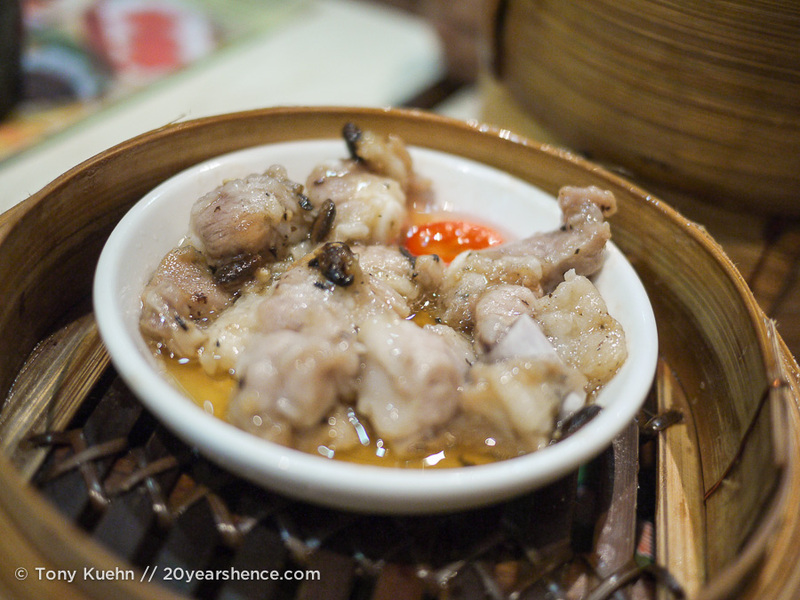 In a city as big and busy as Hong Kong, these moments of genuine human connection cannot be overstated and honestly made our meal at ODS one of our favorites during our time in the country. 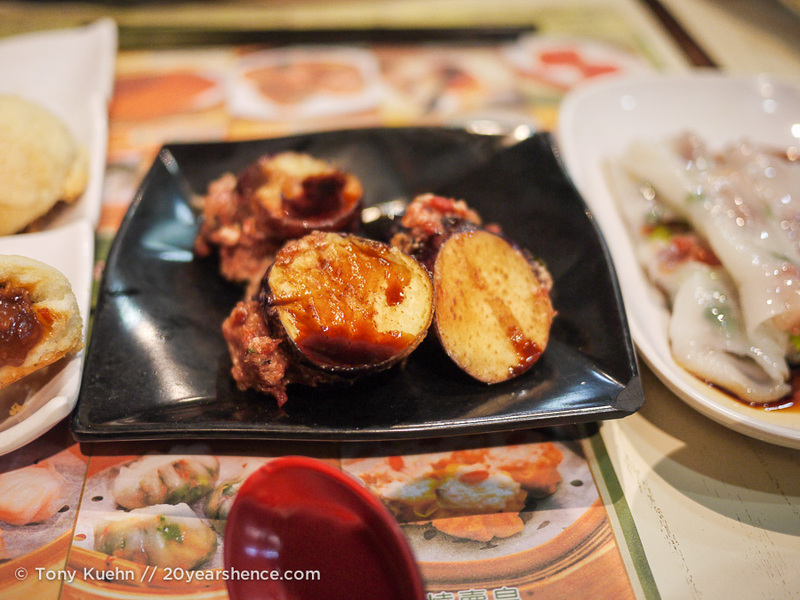 If you place a premium on excellent service—and why wouldn’t you?—and want fantastic food without a wait, then you should absolutely give ODS a shot if you’re ever in Hong Kong. I am drooling looking at these photos! I love that you guys made your own battle of the dim sum. I used to go every Sunday at home… missing it big time! Oh. My. God. That has made me hungry, and I’ve just had two quesidillas for dinner. I can’t believe I never knew these places existed, and now feel I’ve squandered every visit to Hong Kong I have ever had (and there have been many)!!! Seriously, even though we pretty much ate our way through Hong Kong, I still feel like we missed out on so many opportunities! Before we leave Asia, we definitely want to head back because we definitely have more eating to do (and yes, our plans would involve returning to both of these places!). That’s some of the best looking dim sum I have ever seen! There’s so much variety! It kind of looks like the ‘mandu’ I eat in Korea. Yeah, this was some pretty spectacular dim sum. 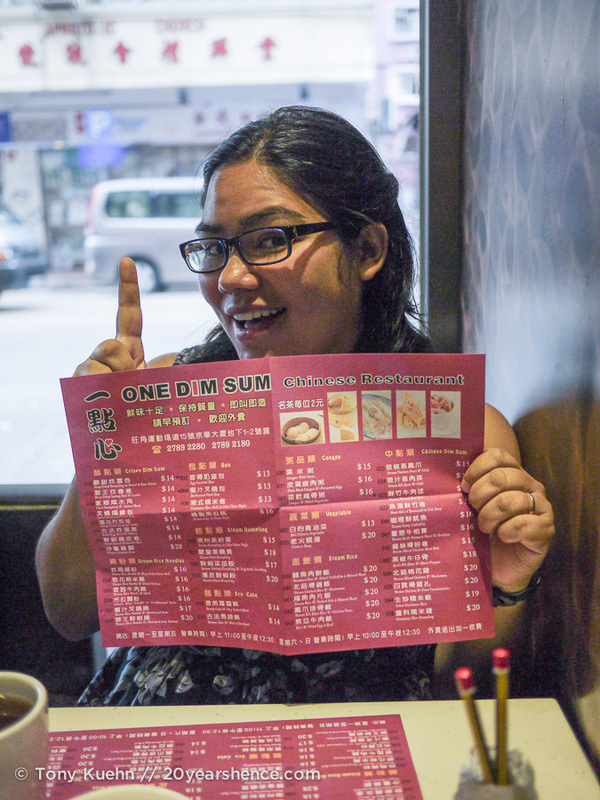 When it came to eating, Hong Kong totally brought it! Never tried mandu! We aren’t actually very well versed in Korean food at all, but that is something we will have to check out! I’ve waited 2 hours for a table at brunch in Portland…and it wasn’t that worth it. The nice thing about dim sum is that at least you don’t have to wait long to eat once you’re seated. That really makes me want dim sum now. Yes, very rarely does food justify a ridiculously long wait, but in this case, it really was worth it (and I’m not just saying that to justify the trip!). 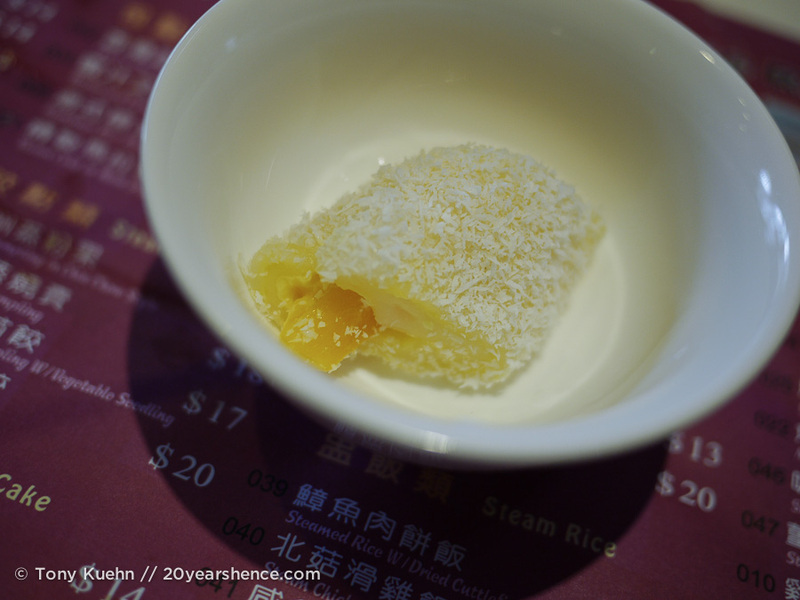 And yes, service at dim sum places is generally incredibly efficient so that just when you think you can’t take it any longer, voila: morsels of magic are there for you to devour! Your food pictures keep getting better and better! I can’t believe how competitive it is to get into some of these places; sounds like it was worth the wait though on this occasion. Just got to Hong Kong a couple hours ago and have plans to be in line tomorrow at 11am! I will eat ALL. THE. FOOD. Don’t let us down! I know you won’t be disappointed. SO GOOD. Eat an extra char siu bao for us!